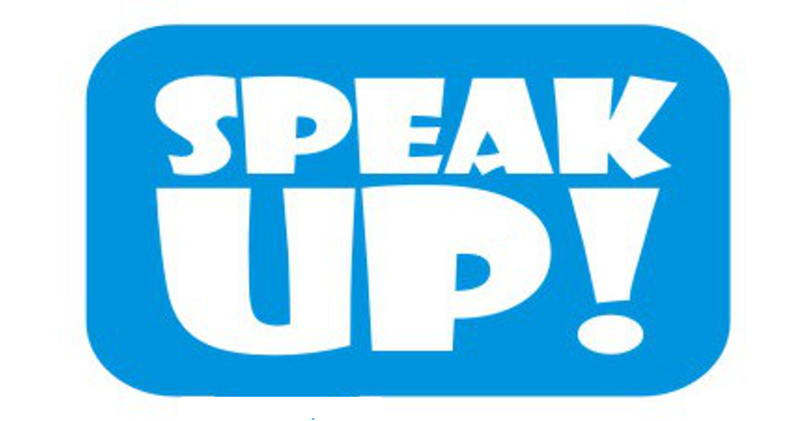 Did you act on our November invitation to speak up for area GT students? Maybe life and commitments got away from you and now it’s December. It’s not too late! Stillwater Area Schools are inviting the community to be BOLD (Build Opportunities for students to Learn and Discover) and contribute insights about the steps district leaders need to take to enact the Bridge to Excellence. The next district community conversation is 6pm, 12/7 at Stillwater Junior High. A wide variety of voices is the key. Step forward, share your input. Need a starting point? Review the questions we ask to help your thoughts take shape. Need contact points? Here you go! How does this tie into the community survey mentioned in this #TBT post? Visit our FAQ. This #TBT update originally appeared on our website in May 2015. 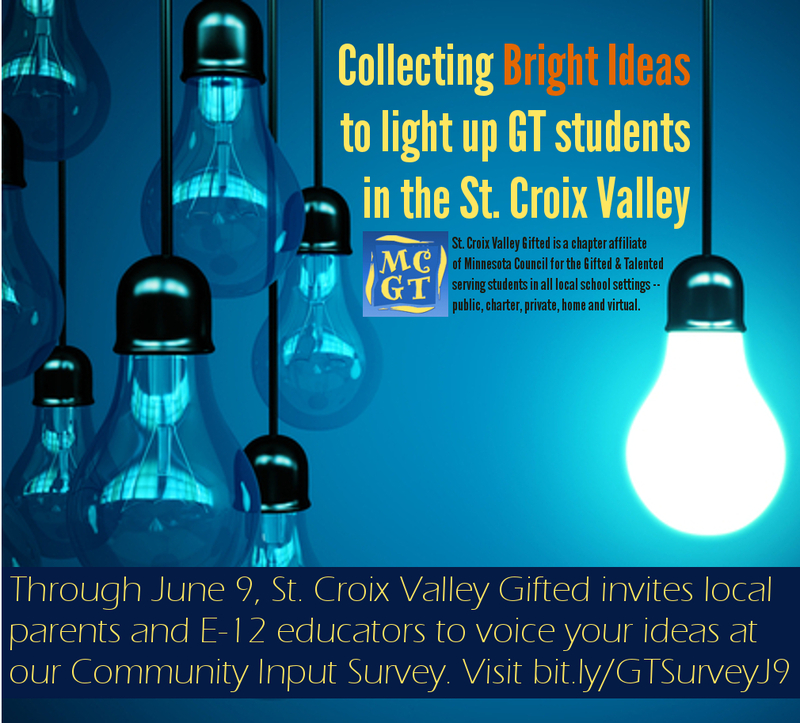 We’re collecting your bright ideas to sharpen the focus and effectiveness of 2015-2016 St. Croix Valley Gifted meeting topics and community action efforts to support GT learners. Still have input or missed the survey? Friends and colleagues at ANY area schools and preschools — public, charter, private, parochial, virtual, home school — who have input about meeting the needs of GT students in the St. Croix Valley are invited to contact us. 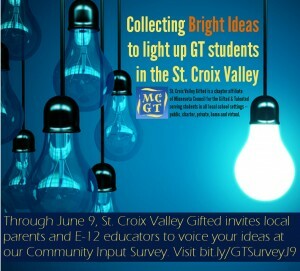 What the Survey Asks | This short and anonymous survey asks what’s on your mind and what you’d like to see in future so St. Croix Valley Gifted can focus programming and community efforts accordingly for students, their families and area educators. How Results will be Used | Results will help us match our efforts with your priorities and to have a clearer picture of the community this MCGT chapter serves. Our chapter board will meet during the Summer to discuss survey results and how we can put your input to use for 2015-2016 planning. If you would like to be part of those conversations and resulting efforts OR address questions that are not on the survey please contact us. Thank you for taking a few moments to contribute your ideas!